Occupation of the Old Chesnut Tree on George Green. Road Protest site at George Green, Wanstead, London. 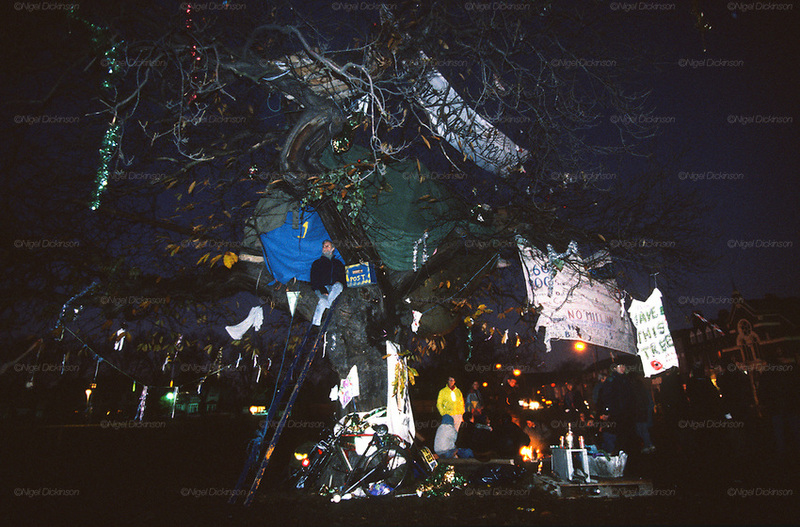 The M11 link road protest was the start of a major anti-road protest in Wanstead and Leytonstone, in autumn 1993 opposing the construction of the M11 Link Road. It began with a protest to save the 250-year-old sweet chestnut tree that grew upon George Green. In winter of 1993 dozens of protesters occupied a house on George Green, Wanstead. In the early morning of 7 December 1993, several hundred police and bailiffs arrived to evict the protesters, which took a day hours to carry out. The British Road Protesters movement began in the early 1990s when the Donga tribe squatted Twyford Down to save this beautiful site, a site of scientific interest SSI from the Ministry of transport's road building programme which threatened to destroy the landscape. The Dongas was the name of the ancient walkways, the paths trodden in the middle ages by people walking down to Winchester. A small tribe were joined by people of all walks of life who came to Twyford Down to defend it. A long hard battle over several years ended in the 'cutting' a new motorway built through this ancient monument and destroying it.